Even before today’s devastatingly tragic earthquake, a confluence of negative factors had begun to pile up behind the Yen. Low interest rates. Low GDP growth. Political infighting. Record national debt. Declining current account surplus. Lack of interest in investing in Japan. In short, while the Yen deserves credit for perseverance, I have to believe that the day of reckoning is near. In fact, this trend is being driven in part by low interest rates. Japan’s benchmark rate is basically nil, and long-term rates are proportionately minuscule. If not for perennial deflation, real interest rates would probably be the lowest in the world. Given that the Bank of Japan probably won’t raise interest rates for another two years (it’s actually quite ridiculous to even broach the possibility at this point, given that it hasn’t even finished unrolling its monetary easing plan), this phenomenon will only further entrench itself. 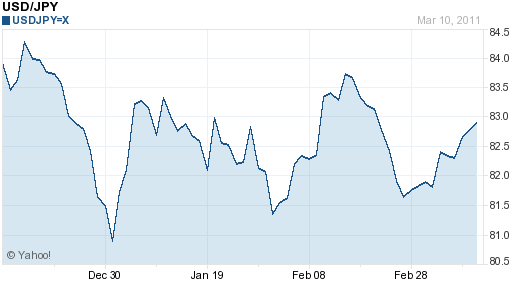 It seems that the forex markets are finally taking notice, due in part to last week’s rumblings about ECB rate hikes. As a result, the Japanese Yen is set to resume its role as the funding currency of choice for carry trades. According to a Bloomberg News analysis, in 2011, “Carry trades using the yen gained 23.8 percent [on an annualized basis], compared with 2.8 percent in dollar-funded trades.”That represents an about-face from 2010, when the Dollar was the most profitable funding currency. In addition, volatility is slowly returning to pre-credit crisis levels, increasing the stability (and hence, attractiveness) of the carry trade. 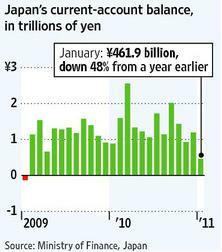 As if that wasn’t enough, the government of Japan continues to run massive budget deficits. Wary of the growing national debt (and perhaps of the recent downgrade of Japan’s sovereign credit rating), the legislature appears unwilling to sanction the issuance of more debt. For better or worse, the resultant political standoff could lead to the ousting of Prime Minister Naoto Kan. If recent history is any indication, it seems unlikely that his successor will break through the political stalemate that seems to plague the country. It’s hard to find a single analyst that is bullish on the Yen. “The yen may weaken to 86 per dollar by the end of the second quarter and 90 by the end of the year, according a Bloomberg News survey of 40 forecasters.” Meanwhile, speculators are net short the Yen for the first time this year, according to the most recent CFTC Commitment of Traders report. It has already weakened 8% (on a trade-weighted basis) from its 2010 peak, and has depreciated against every single major currency in 2011. Perhaps the strongest indication is that the Bank of Japan has announced that it is no longer preoccupied with the Yen, despite the fact that it is still within striking distance of its all-time high against the Dollar. In short, while I hesitate to broach the earthquake again for fear of sounding callous, I think it might just provide investors with the excuse they need to send the Yen down, down, down. So why is the Yen rallying so much today then? @Adam, I agree with you completely. JPY has been heading into a mess for a while, the whole country is/was in an economic mudslide for a heck of a long time. The Japanese were just not adapt to the failures of the 80s and never really came out of the lost decade. Their inability to judge the population is what drove them to this point. Add this latest natural disaster and you have a perfect storm.